There are no absolute rights or wrongs when it comes to writing songs; what sounds good in music is to a high degree individual. In addition, originality is good, and therefore you have to be creative and find your own methods to create. Nevertheless, there are some theoretical things to know about and other tips that can lead to improvement – that is the purpose of this guide to songwriting. Intro – The intro can be a soft piano arpeggio or some finger picking on the guitar. Sometimes the intro is of great importance for establishing the atmosphere in the song, in other cases it can be a merely functional intro that moves hastily to the first verse. Verse – This is an important part of the song that builds it up with both music and text. There are lots of ways to write a verse and arrange the music. We will look deeper into this soon. Bridge – The function of the bridge is to launch the chorus. This tends to be an instrumental part in many songs. Chorus – The chorus can be the difference between a hit and just another song. A song doesn't have to include a chorus, but it is very common and it is a way to shift tempo and deliver some intense quality. Tips on creating a chorus will follow. Solo – A solo can expand a song and give it an exciting instrumental break. A common practice is to place the solo after the second chorus. Outro – The outro can vary in many ways. The simplistic way is to just let some last chords ring out. Another way is to use a so-called fade out. The fade out can for example be done when the chorus is repeated. Sometimes, the song starts with the chorus, for example "Hello Mary Lou" by CCR. It is also common that the first verse is repeated as the last. If you are more interesting to get started then learn theory about songwriting, some ideas will be presented here for you. Songs are often built by chords. If you are familiar with the pentatonic scale you could add some licks based on the Am Pentatonic. Notice that the last chord in the chorus is the V-chord in the key of D and therefore it will resolve great when the song return into another verse part after the chorus. The biggest part of the text in a song is normally placed in the verses. Besides how good the text sounds when it is being sung, it is also of great importance how the text corresponds with the chords. A great song can share the chord progression with a poor song; thus, it can be declared that it isn’t the chord progression that makes the song. The text and the chords are important in the way they assimilate. The function of the verse, from a lyric point of view, is to tell a story, which the chorus becomes some kind of statement of. An important part of the verse is the chord sequence. There are many ways to go and some will work better than others. The chord sequence C F G C is perfectly well as an ending, this is a classic cadence, but starting a song by C F G C F G and keep going will end up monotonic. Instead, something like C Em F C G C F G generates more movement forward in the song and a richer harmony. Listen on the chord combinations you play and try to find out how different orders fit in different parts of the song. To find a melody that goes with the chords, you could try to whistle as you play. Are the most chord progressions already used? There are thousands of chords, although there are only twelve notes. This must logically lead to that there will always be more chord progressions to discover, but also that many progressions with the most common chords already being used. One important thing to remember is that it is not only the sequence of chords that make the song, but how they are used together with strum patterns, expressions and other elements. Therefore, you are allowed to use a common sequence like G – C – D when writing a song. You may want to check out some chord progression tips and even more important might this table showing the relationship of chords be. We shall look at two songs that both use only three or four chords: “Should I Go or Should I Stay?” by The Clash and ”Helpless” by Neil Young. In the first case, the chord progression and its rhythm are very important for the songs and are used like a riff. In the latter case the chord progression repeats itself through the verses and also the chorus. In “Should I Stay or Should I Go” the main riff goes D G D together with some muted strums plus a hammer-on. The song can be sorted out as a riff-driven song and the text isn’t very important per se. But we could put some attention on the relation of syllables. There is a strong pattern between the lines in matters of syllables and this is something to be aware of in the process of writing your own songs. By focusing on the syllables, you get a better flow through the verses and the song will get a more stable form. The next song, “Helpless” by Neil Young is more of a text-oriented song. In other words: how the singer tells a story and expresses the lyrics matters a lot. (D)Baby (A)can you hear me (G)now? (D)Baby, (A)sing (G)with me some how. The playing techniques here are all about strumming pattern and find the right feeling. From a songwriting perspective we can see that the song is based on solely three very common chords. 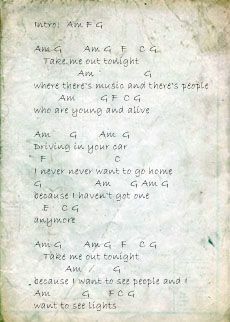 This gives the conclusion that songwriting not necessary are about finding new and unique chord progressions. Very often it is more about how the words are assimilated with the rhythm and timbre of the chords. This is a non-perfect rhyme, yet it constitutes more than enough to absorb the lines together. The number of syllables differs some, but there are also similarities: in both verses the first and third lines have most syllables while the second and fourth have the least syllables. This contributes to the form of the song. For the two examples above, chord progressions in the same keys were used. To create songs with harmonies that doesn’t sound all that familiar, you should strive for progressions that includes chords outside the key. In the Beatles song "Across the Universe" the sequence F#m - Em7 - Gm - D creates a distinctive harmony. The sequence leads to D that is the key chord in the song, but includes also Gm that doesn't belong to the D major scale. The verses in a song are by nature repetitive and the risk is that they will sound monotonous. For a songwriter, it is not enough to just create a chord progression and strum them throughout the song. After a while it will tire the listener. Two fields that are important in this aspect of a song is rhythm and sometimes dynamics. In the case of guitar, the rhythm is mostly about strum pattern and to include variations in accents on down and up-strokes. A skilled guitarist could create something unique purely from strum patterns and this is also an important component of the expression in the song. The changing in loudness in a song can sum up the dynamics. A guitar that plays through a whole song in the same volume can feel monotonous. So, by increasing or decreasing the volume in some part of the song you can accomplish vitalizing effects. Another way to mix up the song is by changing the order in the chord progression. A quite common progression in the key of D is D - F# - G - A. It is nothing wrong in this one, but by change the order you could land on something less familiar. Try for example G - A - D - F#. Chorus should not be thought of literary, that many sings simultaneously. It is just the term being used for the part of the song that often is repeated between the verses. How often the chorus is repeated differs, but in many songs it is introduced after the second verse and when repeats one, two or three times or more. According to a study released in 2015, the success of a pop song is partly depending on how many times the chorus repeats and the chance for the song to become a hit is increased by 14.5% for every repetition. But everything is on the other hand not about making a hit song. Here is "my hometown" first singed twice on the same chord and when on the third time with higher frequency of chord changes in combination with a stretching of syllables. This is an easy and - rightly done - effective method to create a final line of a verse that lifts the song and serve as a hook. One thing worth notice here is the simplicity of three almost exact same lines, but with an important difference in the subtle shifts that transform the harmony by the chords (Em, A7, C, G). Another thing in a song that is important for the memorizing of it is the “hook”. The hook can be described as a repeated phrase (which also can be instrumental). It is often part of the chorus, but not always. For example, in the Bryan Adams song “Sommer of ‘69” there is no distinguish chorus, but the line “Those were the best days of my life” are being repeated in the last of several verses and creates a vital feature of the song. The shift from verse to chorus sometimes involves a change of key. To change key before the chorus increase the contrast and gives new possibilities of chord progressions. In the first example, we change key from A Major to C Major (notice that Am belongs in the key of C). In the second example, we change key from A Major to D Minor. Here we use a transition of three chords when going from E Major to D Major. Notice that A and F#m belongs to both keys. In famous the song "Oh, Pretty Woman" by Roy Orbison the key changes twice. It starts in A, changes to C and back to A. This is made by the A - F#m - D - E verse via a Dm - G7 bridge to a C - Am - Dm - G7 - C chorus. More in-depth readings could be found in The Guitar Player's Songwriting Bible. When you finally have written some songs, you may want to record them and listen to the result. If you don't like the idea to handle a lot of equipment, the easiest way is to use either a USB-microphone (you only need a computer) or a portable digital recorder (you don't need anything extra, although it can be connected to a computer). You can find USB-microphones for under $20 and portable digital recorders with studio-quality sound for just under $100. For example Behringer XM8500 Dynamic Cardioid Vocal Microphone or Zoom H1 Handy Portable Digital Recorder . Here are some final questions and answers about writing songs. How long does it take? It can shift from fifteen minutes to several months. Some songs could be born in an instant when others are taking form successively. Sometimes are the verses written, but the songwriter doesn't succeed in create a good chorus. Songwriters have often many different fragments of songs lying around and suddenly, perhaps two or more fragments seem to match into a great song. How to get ideas for a song? A common method is to listen to music and be inspired. To make music is often indirectly a process building on existing music. Not in that way that another song is copied, but being a foundation for inspiration. The method could also be expanded to turn old song into new by modernizing. Many hits have been done this way, for example Elvis Presley's song "Love Me Tender" that was based on an old folk song, "Augie March". What to do if you don't like your singing? One way is to keep singing. Your voice will get better. Another more direct way is to try to change the key of the song or even change instrument. Perhaps your songs sound better over a steel guitar than a nylon or vice versa. 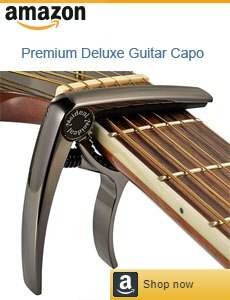 A good idea is also to use a capo and try it on different frets. How to avoid getting stuck? If your first attempt to write a song didn’t seem to work out gloriously, just start over with a new one. If you write ten songs instead of one the chance that you write one good one will obviously multiply. How many chords to use in a song? There is absolutely no rule about this. But one or two chords will probably be too monotonous. A huge number of chords are not a formula of better songs. It can be too sprawling for the listener's ear when too many chords are in action. Some great classic songs only include three or four chords. How to find a melody? If it was an easy answer one this one, articles like this one wouldn't be needed in the first place. One thing you can try instead of singing the words is to whistle, it can sometimes be a shortcut to finding a melody. The image on the top on the page with song lyrics on a paper is only a montage and not authentic.